Here is a place where smooth jazz, romantic songs, Latin flair, and enormous doses of musical sugar meet. 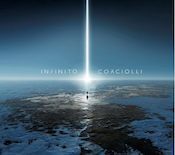 If we consider Infinito strictly from the quality of the playing on it, it’s really quite good. The composer’s piano playing is elegant and sweeping; Leonardo Padovani brings classic violin lines to several songs; Gracieli Valverde’s operatic soprano stirs the soul on “Dandelion.” But wow, does this album make Yanni sound like he’s playing death metal. It does have its moments, but they’re just that: moments. I confess that I do bop along a bit to the distinctly 80s synth-bounce that powers “Dandelion” and “Spiral” (conjuring memories of Jean-Luc Ponty). I like the toe-tapping, star-twinkling adagio of “Lacrimae” with Padovani on Chinese strings, and I groove on the nicely chilled bossa nova lines of “Mono No Aware”—those things being said, I typically couldn’t get all the way through the songs here because they’re all just too cloyingly sweet for me. They make me want to give someone a longing, come-hither look across a restaurant table, knowing that love is in the air. (Ah, here comes Padovani again, like the violinist making his way from table to table, laying down an invitation to tango on “San Telmo.”) If you like your music super-light and overloaded with by-the-book romance, you might enjoy Infinito. Too sugary for me. Available from Corciolli’s web site.